About the still (unfortunate) wide variety of couplings and the different atitudes to them. Inspiration from Canada created this micro-layout in HO and a 3-2-2 Inglenook by Jack Trollope derived from it. A compact American layout in HO varying the Inglenook. The actual setting inspires a commuter line. Suggestions for a Cornish style compact layout of character in OO/HO. The depot at Lazy River lies by the river side at the end of a rural back-woods railway in America in HO. Concluding part of article in 76/107 about building a small seaport layout. 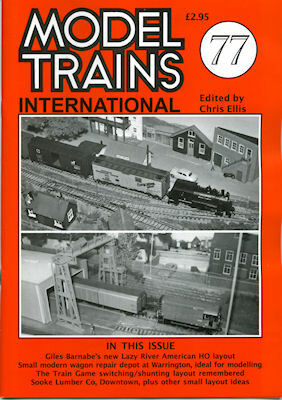 Recalling a layout idea from 1972 and variations on its theme of the classic 'Timesaver'.